Do you smell it, friends? No… Not the lingering aroma of the perfect Thanksgiving turkey. Not the smell of the fire burning in the fireplace of your grandma’s house. Not the leftover pumpkin pie you ate for breakfast. That crispness. That first, beautiful scent of the holiday season. It’s here. Today, friends, in honor of a Black Friday I will not be participating in (because, truth be told, the aforementioned leftover pumpkin pie is calling my name), I bring you my annual holiday gift guide. As usual, we’re focusing on putting the chic color “black” in Black Friday. 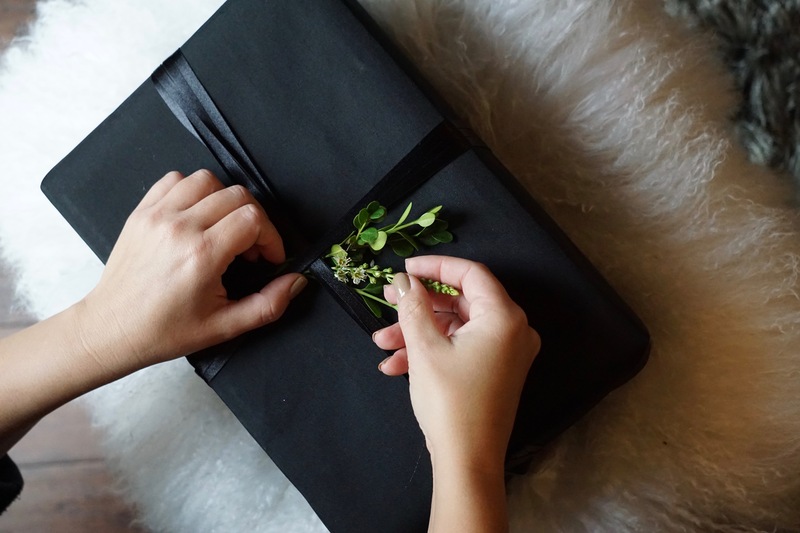 This year, however, the man and I are toning down our pile of presents, so I decided to focus on gifts that were small enough to tuck inside your fireside-hung stockings. * For the girlfriend who spends most of her life on her phone (face it- don’t we all? ), this charging cable from Casetify that’s masquerading as a cute, tassled keyring. * For the guy who just loves a droopy, squishy hound dog (I’m looking at you, Mr. Mills), these sweet socks from J. Crew will do the trick. Plus, studies have shown that men who wear fun socks are generally more successful- no joke. * For the friend who loves the latest grooming gadget, this fancy new toothbrush from Quip is supposed to revolutionize the way we brush our teeth, finally improving the design of an electric toothbrush. * For anyone who’d like a little beautiful wrapped around their neck, this lightweight scarf from Burberry will keep you warm, go with almost anything, and look totally chic. I have the white version from a couple of years ago, and have almost worn the thing to death. * For the traveller, a set of traditional Ray-Ban aviators would be lovely, but wouldn’t this foldable version be even better? Perfect to pack in a suitcase, in your car console, or in a weekend bag, and look just as cool as the OG. * For the feminine friend: this cute little compact from Kate Spade will make applying her lipstick more fun than usual. As a bonus, the gift wrapping from Kate Spade is always top notch. * For the uber techie or the serial TV watcher, Apple TV is the cool, new thing going as far as couch-flopping at home. * And for myself, this candle from Byredo has a scent reminiscent of my favorite thing in the world: clean, fresh sheets. Perfect.